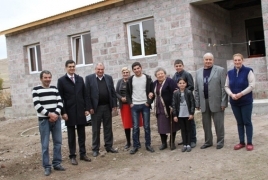 PanARMENIAN.Net - VivaCell-MTS and the Fuller Center for Housing Armenia continue the housing project they have launched to improve people's lives. The Mkrtchyans from the village of Tatul of Armenia's Aragatsotn province used to live live in a house with dilapidated and damp walls without a roof for years. The moldy walls could have caused many serious health problems for the family. Volodya, the family father, remembers how he, his wife and children had to live in a damp and cold half-built house lacking basic housing conditions. Due to social conditions, the half-built house has remained unfinished for 10 years. About half a year ago, with the support of the partnering organizations, construction work started in the half-built house of the Mkrtchyan family. The walls were covered with tuff stone, the roofing was done, the bathroom built and inside renovation works were carried out. The panel building with temporary roofing has now become a comfortable home. The teams of the partnering organizations again visited the Mkrtchyans, this time, already for celebrating a housewarming. “For many years we have lived in a panel building with thin and dilapidated walls and old and damaged roof. The walls of the house have become damp and moldy due to the successive hot and cold. After being included in the program, I've worked day and night to finish the construction works a day sooner. Now, we have a safe roof, а warm and decent home; the dampness, the leaking roof and thin walls are already in the past. I am grateful for this great support,” said Volodya. Owing to the efforts of the partnering organizations, the housing problem of over 160 families has been solved. Thanks to the project, not only a solid foundation and a safe roof is built, but also a reliable future. “This program is of great importance to me: it has not only a social, but also a healthcare component. The half-built construction, where the family used to live for years, could become the cause of serious health issues, as the mouldy walls harm more than the appearance of the house. I am glad that just another family has been able to solve the problem of so many years. Today I am more interested to see the positive change in their mood and the optimism towards future. One becomes ready for new goals and challenges, if tomorrow’s day is not uncertain,” said VivaCell-MTS General Manager Ralph Yirikian. “It's gratifying to share the happiness together with the Mkrtchyan family and to see a belief to have a better future in their eyes. I can surely say that this project is successful, as year by year we are able to bring happinness to more families,” said Fuller Center for Housing Armenia President Ashot Yeghiazaryan.